The Axolotl is a neotenic salamander and is considered to be one of the world’s most unusual and unique species of salamanders. The ‘Mexican Walking Fish’ as it is commonly referred to, isn’t actually a fish – it’s an amphibian. Axolotl can be found in Mexico in freshwater lakes and ponds. What makes this such an unusual amphibian is how it reaches adulthood. It does not undergo metamorphosis (the process in which they develop lungs and legs and take to land) that typically occurs in amphibians. The Axototl retains the characteristics it develops at the larval stage, keeping its gills and retaining an aquatic life. The Axolotl measures between 15-45 centimetres in length at the adult stage. They will weigh about 0.06 to 0.1 kilogram, but can reach 0.5 kilograms in captivity. They feed generally on smaller species of aquatic life mostly focusing on tiny fish, mollusks and arthropods. Their diet can vary to include additional fresh water creatures such as terrestrial worms, salmon eggs and zooplankton. The Axolotl is classified as a critically endangered species. In fact, it is almost extinct due to invasive species being introduced into its habitat, as well as habitat loss. 1. Axolotl have an astonishing ability to regenerate body organs and lost limbs. 2. 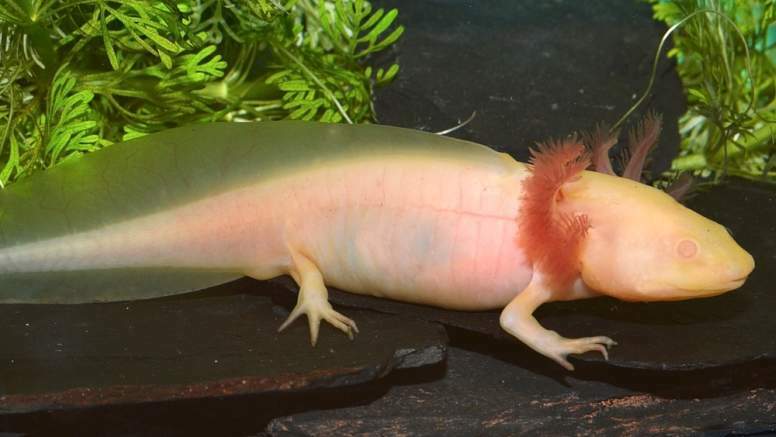 Axolotl can regrow the same limb up to 5 times. Then it stops. 3. The feathery looking branches that extend from either side of it’s head are its gills. Axolotl retain their gills, but also have lungs that are fully functional. They will often rise to the surface for a gulp of air. 4. The Axolotl is also over 1,000 times more resistant to cancer than mammals. 5. Axolotl are only be found in Mexico. Their natural habitat is Lake Xochimilco, an ancient network of lakes and canals in southern Mexico City. Although they also survive in aquariums, water tanks and research labs around the world. 6. This Axolotl does not chew its food, it feeds by using suction. It does this by using rakers that interlock and close the gill slits as food is sucked into the mouth. They are carnivorous, and eat worms, tadpoles, insects and even small fish. 7. As a bottom feeder, the Axolotl makes good use of gravel that gets sucked up with food. Gravel is commonly combined with the small aquatic life that gets sucked into the mouth of the Axolotl during feeding. However, this is not a bad thing. The fish will actually use the consumed gravel to provide a grinding action on food in much the same way birds use grit to help break up food for digestion. Plus, the Mexican Walking Fish uses gravel in its body to regulate buoyancy. 8. Although critically endangered, the Axolotl has very few predators. In the wild, the Axolotl is pretty much on its own, although it does have a couple of other aquatic competitors that consider the Mexican Walking Fish as part of their food chain. The Carp and Tilapia happen to enjoy the taste of Axolotl. 9. The Axolotl anatomy has a very unique characteristic, known as neoteny. This is the term used to describe animals that keep their juvenile characteristics until adulthood without undergoing many phases of change. 10. The word Axolotl comes from the Ancient Aztecs who revered them, and translates to mean ‘water dog’. The Axolotl has a mythological connection to Xolotl, which was a dog-headed Aztec God in mythology. Xolotl was the god of fire, lightning, deformities and death. According to myth, the Aztec gods needed to sacrifice themselves to the sun, to keep it alive and moving across the sky. However, Xolotl was fearful of being sacrificed and transformed into a maguery plant, and then an Axolotl to hide. 11. The Mexican walking fish male and female are easy to identify. The adult male has a large, wide head and eyes without eyelids. They also have a longer tail than the female and a swollen cloaca which is lined with papillae. The females have a smaller cloaca along with a round, plump body. The female is also often shorter in length than the male, but not always. Both the male and female Axolotl have four pigmentation genes which can produce different color variations during mutation. As their skin is permeable, it is common to find these water creatures in albino form. 12. The breeding season for the Axolotl is early in the calendar year. As this fish reached sexual maturity by the time it reached 6 months of age, the breeding season typically runs from March to June. Spawning takes place in the late winter which is when water temperature and levels are more temperate. Breeding typically occurs once a year in the wild however, in captivity two and sometimes three breeding cycles are possible. 13. The breeding ritual includes a dance. The male and female Axolotl begin the breeding process with a waltz. Essentially it is a dance between the two of them that serves as the initiation phase of mating. Both the male and female will rub and slide against the other’s cloaca while dancing in a circular fashion. The male will eventually drop a cone-shaped mass with a sperm cap. He does this following about 30-seconds of vigorous tail shaking. The female will pick up the deposit with her cloaca following a tail shaking display and fertilization begins. 14. The female Axolotl lays a massive amount of eggs in a protective cover. There will be between 300 and 1,000 eggs deposited in the water by the female. Each is attached to a protective substrate. The eggs are individually laid and are typically placed on plants or rocks in order to protect them from predators. The eggs will hatch in about two weeks and the young Axolotl are independent from the moment they emerge from their eggs. In other worlds, the parents do no parenting whatsoever. The hatchlings quickly learn how to fend for themselves and will consume brine shrimp, daphnia and micro worms during their juvenile stage. 15. Aztecs in ancient Mexico used to dine on these fish viewing them as a delicacy that was not only considered to be a rare treat, but they were also consumed for nutritional purposes. Francesco Clavigero proclaimed in 1787 that the Axolotl was good to eat and had the flavor and taste that closely resembled that of the eel. 16. Sadly, the Axolotl is classed as critically endangered on the IUCN Red List. 17. 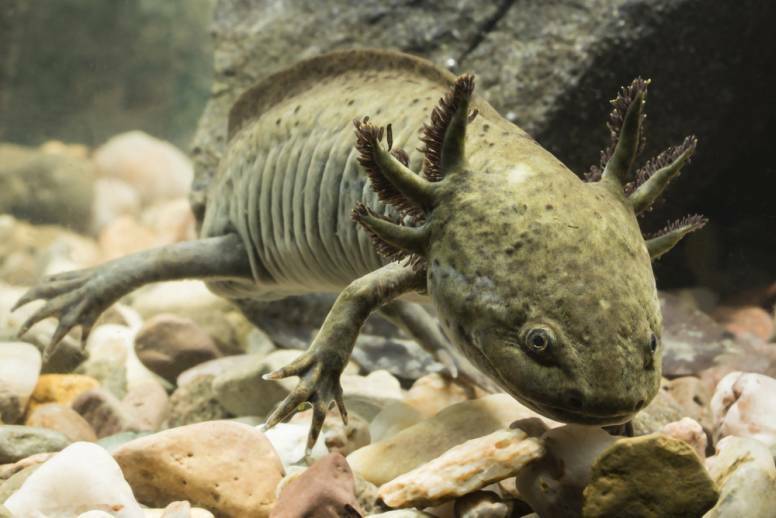 Researchers are encouraging Axolotl to breed by building ‘shelters’ in Xochimilco. 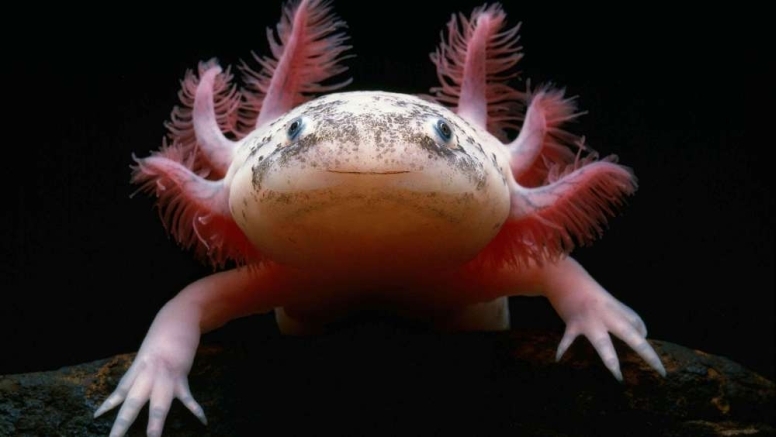 “Regeneration: The axolotl story”, via Scientific American. 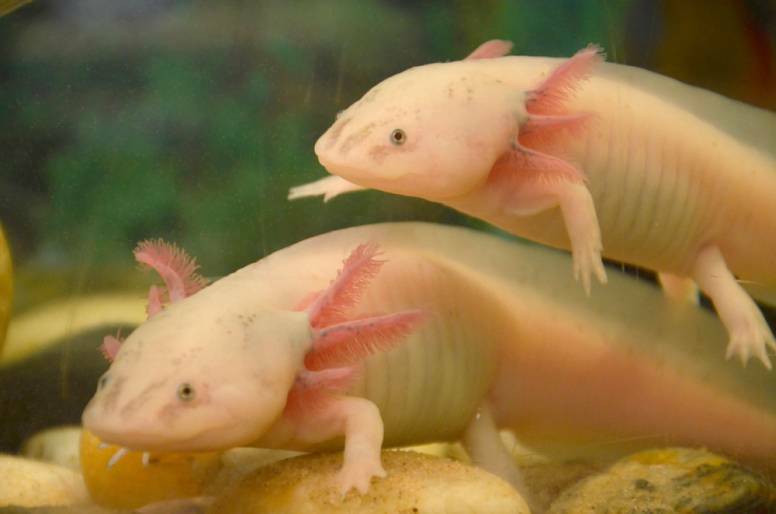 “Regeneration: What the axolotl can teach us about regrowing human limbs”, via Harvard University. “Axolotl”, via IUCN Red List. 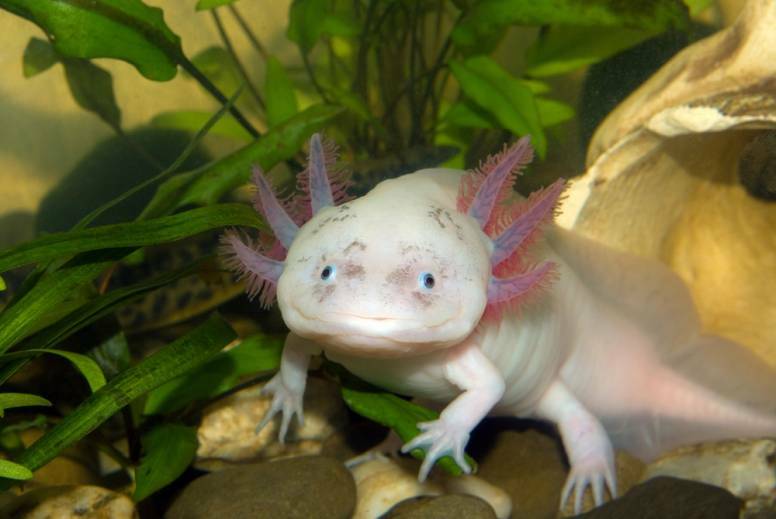 “Axolotl found in Mexico City lake after scientists feared it only survived in captivity”, via The Independent.